Soooooo....long time no post!! And for my first time posting in a very very long time, I have major news!!! EyeScream Industries is retiring!!! You can read the posts on my Facebook to keep more updated in real time ;) Since I am retiring the brand, I am holding a serious, super awesome clearance sale!!!! So go check out the shop, buy yourself some of the last EyeScream pieces EVER!, and enjoy :) Oh, and shipping is FREE to the U.S. in addition to the great prices!! ;) Thanks for all your support and business for the last 13 years!!! x0x0x CLICK ME FOR SHOPPING!!! Designing and creating wearable art is my personal concert. Fabric and thread keep the bass lines and drum beats steady, while the trim and embellishments provide the guitar and vocals to round out the performance. My designs are born from the echoes of life and can be as loud as a Metal scream, or as quiet as a ballad. I allow music to not only be my background while designing, but my guide. It shapes the path of my design and leaves the message I want to pass on in the final product. 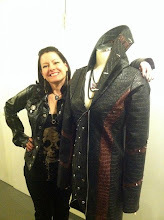 As a self-taught, independent designer, I take extreme pride in creating one of a kind pieces. The imperfections of handmade bring a sense of love and respect that mass-produced garments just can’t emulate. By using traditional and innovative techniques, I create pieces that I will never replicate, so that each piece allows the wearer to express their own unique self without hesitation. I am extremely proud to have designed for bands such as The Dirty Pearls, The Last Vegas, and Cockpit, and look forward to seeing more of my pieces displayed on stages where they belong.